Stressed from Heat? So Are Your Plants. The extreme heat and dryness we have had during our summer has put a lot of stress on our plants and lawns. Sporadic heavy rains, intense heat and winds cause water to evaporate very quickly from the leaves. If the roots can’t absorb and convey water fast enough to replenish this loss, the leaves will appear wilted, brown or spotted. Flowering shrubs will drop their blooms and buds will dry out and drop off and not develop. During excessive hot days SUNBURN can occur on shade or sun plants. The symptoms are large spots, dark blotches or whitish/yellowish bleached appearance – between the veins are all from damaged tissue that were allowed to dry out. 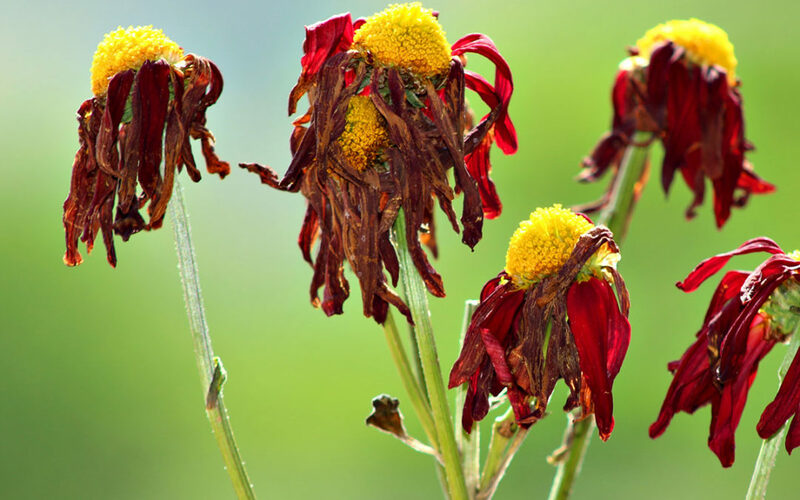 UNDERWATERING plants will survive but do not function normally and leaves frequently burn and wilt over the entire plant. Mulching is good for plants but don’t allow the mulch to touch the base of the plant. On certain trees or shrubs mulch may cause foot rot and this disease can and will cause death in the plants. Do not let the soil dry out to the point where spotting or leaf scorch occurs. In planting, incorporate TERRASORB PLANTING GEL to help keep the moisture around the newly planted plants with ORGANIC PEAT or PLANTING SOIL with GARDENTONE OR MILORGANITE FERTILIZER. (MAKE A $50.00 HOLE FOR A $10.00 PLANT.) Your plants will survive a hot summer as we have had this year. In ground, plants can also use TERRASORB PLANTING GEL by making 10-15 deep holes in the ground placing 1 OR 2 teaspoons and distributing evenly in the holes. Prepare bedding plants and fall vegetables now. It can be very rewarding if it is properly done. Here are some important things to keep in mind when choosing the proper place for your vegetables and flowers. Plant the vegetables that you and your family like, do not plant too much of any one vegetable at one time as this makes for a feast and a famine. Plant flowers you can enjoy, by watching butterflies or useful for cut flowers in the home for color. Be sure you can grow the vegetable or flowers for this time of year or you will be disappointed. See section PLANT NOW. For vegetables or flowers prepare soil prior to planting by incorporating organic soil such as Peat Humus, Organic fertilizer such as cow manure, Organic 6-6-6 or Milorganite. Add Dolomitic Limestone if pH is too low. For cutworms, mole crickets and other insects scatter bait over the area such as Permethrin or Carbaryl (Sevin) in Granular form. Continue to check for the RED-HEADED CATERPILLARS they can eat your plant in a day. Use THURICIDE, SEVIN or DIPEL DUST. Don’t cut them back they will grow back quickly. If any trimming is done you may risk losing some blooms for next spring. A serious problem this time of year is LACE BUGS causing a silvery effect on the leaf appearance. Use ORTHENE or BAYER INSECT, DISEASE & MITES CONTROL 3 IN 1. As a preventer use BONIDE SYSTEMIC INSECTICIDE GRANULES every 2-3 months. Now is an excellent time to plant new trees and apply fertilizer 3-4 weeks after planting. As fall approaches, summer rains begin to dwindle. Gumming near ground level on the trunk and small yellow leaves with general tree decline may indicate foot rot fungus. To avoid foot rot, improve air circulation by trimming low branches and removing weeds and grass at the base of the tree. DO NOT mulch any citrus tree. DO NOT injure the trunk of the tree with mowers or other equipment as this will give the disease and entry point Check all citrus trees for CITRUS LEAF MINOR, RED SPIDER MITES, COTTONY CUSHION SCALE and CITRUS ROOT WEEVIL-BEETLE (in top of tree) for control use MALATHION & OIL or CONSERVE NATURALYTE. Several applications may be necessary for this control. Spray every 10 -14 days to protect citrus from these bugs. Lack of fertilizer that includes Nitrogen and Magnesium apply Howard’s Fertilizer 16-2-8 with trace elements. Soil pH is off -might need a soil acidifier such as Hi Iron Plus with Minors or a sweetener such as Dolomite Limestone. Wet areas where water drains or where water stands after it rains – use Gypsum to breakup damp, wet or compact areas in the lawn. Lawn pests are enjoying our summer heat such as CHINCH BUGS, GRUBS, SOD WEB WORMS, MOLE CRICKETS AND FALL ARMYWORMS. For insect control: BIFENTHRIN (TALSTAR), CYFLUTHRIN, ORTHENE, DELTAMETHRIN, PERMETHRIN or SEVIN (Carbaryl) to help your lawn to recover. Fungus is also a problem in the grasses this time of year because of the humidity. This should be identified and treated. Bring samples in for identification. The fungus could be ANTHRACNOSE, BROWN PATCH, DOLLAR SPOT, GRAY LEAF SPOT, HELMINTHOSPORIUM LEAF SPOT, PYTHIUM OR RUST. For fungus control: Fertilome Liquid Systemic Fungicide II, F-STOP or PROPHESY. Deadline . . . . September 15th . . . . to cut poinsettias back so they will come into color for Christmas season. After all the rain from the summer, check your plants for Poinsettia Scab which is a fungus that is very contagious to the poinsettia. This is a hard disease to control. The best control for this disease is to prune all infected parts of the plant and destroy these parts. Between each cut disinfect your clippers with pure alcohol or bleach diluted (1 tbsp. per gallon). The plant then should be sprayed with Liquid Copper Fungicide (2 Tbsp. per gallon). It is necessary to repeat spraying to protect the new growth. Fertilize with 100% Organic 6-6-6 or Plant-tone to encourage the plant to grow back. It is now time to groom your rose bushes to enhance fall bloom. Dip clippers in bleach water, 1 tsp. bleach per gallon of water. Remove dead and dying twigs and reduce the length of excessively long canes. This is a clipping NOT a major pruning as is done in January. Continue to spray your roses weekly for spider mites, aphids, powdery mildew, and black spot. For control use Bayer Insect, Disease & Mite Control 3 in 1. Re-establish your roses use 1 cup Bone Meal, 1 cup Agricultural Limestone, ¼ cup Minor Elements and 1 cup Rose-tone. Dogwoods, Redbuds, Pines, Oaks, Sycamores and Maples are all showing signs of summer leaf scorch during the hot dry weather we have during September. Summer leaf scorch is caused by excessive evaporation of moisture from the leaves during hot and windy weather. Water evaporates rapidly from the leaves and the roots can’t absorb and convey water fast enough to replenish this loss. The leaves turn brown around the edges and between the veins. Sometimes the whole leaf withers and dies. Many leaves may drop during late summer. This problem is most severe on the youngest branches but trees do not generally die. Trees that are under stress will show signs of limb breakage, debarking and dying. Preventing stress on trees deep-water during periods of hot weather to wet down the entire root space and wet the foliage also to replenish the moisture that was lost from the heat. Avoid injury to trunk such as lawnmowers, or weed eaters and fertilize to keep healthy trees. Due to excessive stress on Pine Trees – Division of Forestry has seen an out break of a Beetle use ORTHENE, CONSERVE NATURALYTE, PERMETHRIN or SEVIN as preventative spray will help prevent this Beetle. Tall trees must be applied by a professional spray service or a soil drench with Bayer Tree & Shrub once a year. Once you have planted your vegetable plants, watch for insects especially for caterpillars, cutworms, aphids, and fungus. For control use CONSERVE NATURALYTE or HI-YEILD GARDEN & PET DUST. Continue to feed your vegetables monthly to keep them healthy use SUNNILAND BLOOM SPECIAL 2-10-10, ESPOMA GARDEN-TONE or ESPOMA TOMATO-TONE FERTILIZER for blooming vegetables to produce fruit. On leafy vegetables or root crops use 100% ORGANIC 6-6-6 OR PLANT-TONE FERTILIZER. If you have planted vegetables before in that location, stagger and rotate your crop to throw off the normal insect cycle. Use aluminum foil or newspaper collars around each plant to discourage cutworms from cutting the plants off at ground level. When planting vegetables check the pH of your soil. If pH is incorrect can cause certain plants to be deficient in calcium and cause blossom in rot. Here at Peterson’s we can check your soil for free. Bring your sample in DRY not WET. Go down 6” in the soil. Get about a tablespoon soil. Dry it out then bring it in. Only takes about a minute to test the dry soil. Nematode Control use Diatomaceous Earth (food grade) blend in soil. Also you can use broken egg shells or crushed shrimp shells. These items will dehydrated the nematodes in the soil. ANNUALS (H=HARDY; T=TENDER): Ageratum-T; Alyssum (Sweet)-H; Begonias-T; Calendula (Pot-Marigold)-H; Cleome (Spider Flower)-H; Coleus-T; Delphinium-H; Dianthus (Sweet Williams)-H; Gaillardia (Blanket Flower)-H; Gazania Daisy-H; Geraniums-H; Gypsophila Baby Breath)-H; Holly Hock (Annual)-H; Impatiens-T; Larkspur-H; Lobelia-T; Lupine-H; Melampodium-H; Nasturtium-T; Nicotiana (Flowering Tobacco)-H; Pansy-H; Petunias-H; Phlox-H; Periwinkles-T; Statice-H; Stock-H; Sweet Peas-H; Verbena-H; Viola (Johnny Jump-Up)-H.
HERBS (T=TENDER): Basils-T; Catnip-T; Chives; Dill; Fennel-T; Garlic; Lavender; Mints-T; Oregano; Parsley; Rosemary; Sage; Sweet Marjoram; Tarragon; Thyme.